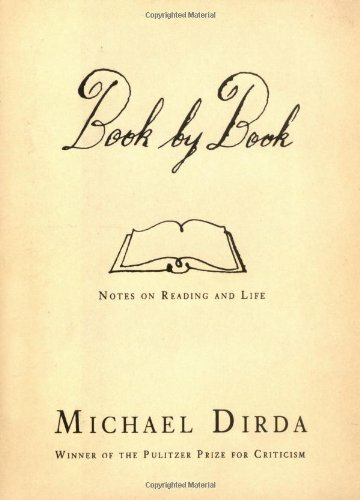 In Book by Book, the Washington Post's Pulitzer Prize–winning critic Michael Dirda shows how books not only educate and entertain us but also shine a great light on our lives. Ranging from Dr. Seuss to Dante, he touches on dozens of themes, including love, leisure, families, experience, and morals. Along the way, Dirda relates all kinds of random and wonderful book–related expertise. One of the longest chapters focuses on what literature tells us about love. Where better to learn about true aching, longing, and desperation than from Gustav Flaubert's Madame Bovary? (For those inclined toward the modern, The Great Gatsby does the trick.) How better to understand passion than by reading the poetry of Lord Byron? Plato's Symposium, of course, offers a gorgeous discussion of the nature of love. Then there are the tales of King Arthur, which bring to life every aspect of love "from raw desire to spiritual transcendence." Fans of the postmodern will enjoy Dirda's recommendations of romantic novels from the last quarter of the 20th century. Dirda encourages us not to read authors just so we can cross them off a list, but to read what actually stimulates us. Adults should heed this advice not only when it comes to themselves but also for their children—especially today, when video games consume more and more of many a child's free time. In a chapter on encouraging children to read, Dirda urges parents to foster any reading interest their child has, no matter how silly or uninspiring the topic might be. (This reviewer remembers her parents, including a mother who worked in a children's bookstore, along with many parents at the time, tolerantly cringing all the way through the Babysitters Club and Sweet Valley High series phases.) "The child who reads The Hardy Boys will read Agatha Christie tomorrow and Crime and Punishment a few years after… The worst thing you can do is ignore or denigrate a child's taste," Dirda writes. Other suggestions include both the obvious—read aloud and make frequent library visits—and the not–quite–so–obvious: ask older kids to read to the younger ones. The activity will do double duty as it improves the older child's reading skills and shows the younger one that reading isn't just for adults. Sprinkled throughout the book are delicious quotations that Dirda has gathered over the years, many of them unfamiliar. For example, here's P.G. Wodehouse on work: "It's odd how soon one comes to look on every minute as wasted that is given to earning one's salary." And Jonathan Swift on marriage: "The reason why so few marriages are happy is because young ladies spend their time in making nets, not in making cages." Not every gem is taken from a literary figure. One of the most delightful is screen star Louise Brooke's observation on Humphrey Bogart: Bogart was "so contemptuous of other men's needs to publicize their amorous triumphs that he refused to notice them. Being supremely confident of his own attractiveness to women, he scorned every form of demonstrativeness. When a woman appealed to him, he waited for her the way the flame waits for the moth." Dirda also offers a master list of "patterning works" or "the knowledge most worth having"—books that later authors "regularly build upon, allude to, work against." Some entries are predictable—Shakespeare, Jane Austen, the Bible, Homer, and Dante. Others, such as Alice in Wonderland, aren't as expected. Shakespeare, Austen, and the Bible reappear as suggestions for a guest library that Dirda says should stock "familiar, cozy, browsable, above all soothing" works. Particularly pleasing is Dirda's inclusion of suggested children's classics to put in a guest library, including The Blue Fairy Book. The book's companions—art and music—aren't forgotten either. Dirda gives us a list of his "desert island discs," and discusses the role of books about art. It's hard to pull all of this off without sounding pretentious or pedantic. As Dirda points out early in the book, "Quote a verse from the Bible or a line from Shakespeare, mention the date of a battle or a character out of Charles Dickens, and expect to be regarded with a mixture of awe and suspicion. Erudition makes people feel uneasy." Yet he does it all with charm and ease. Book by Book brims with so much material, it's hard to take it all in at once. This is a book that, read properly, requires marginalia, underlining, dog–earing, and reading and referring to over and over. Rachel DiCarlo is a Phillips Foundation fellow.